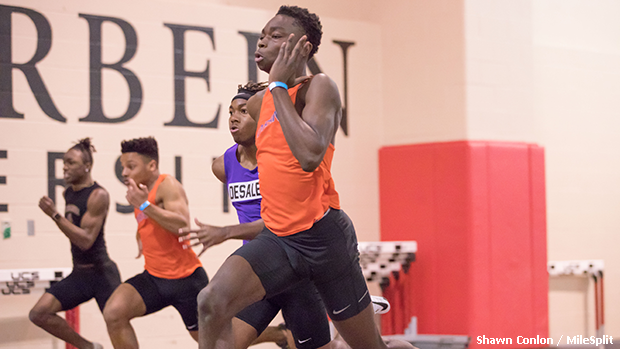 Olentangy Orange's Jaeschel Acheampong will line-up in the 60m and 200m contests. The big meet is fast approaching! Sunday, February 10th is the day and Geneva's SPIRE Institute is the location for the 2019 MileSplit / SPIRE Scholastic Showcase. The annual gathering consistently hosts the best athletes from Ohio and throughout the region and this year will be no different. While every event field is expected to be stacked, the early signs are indicating that the boys sprints could be some of the deepest. With the array of talent that's being assembled, one of the storylines to take note of will be if new facility records are established. Continue reading about a collection of the dynamic sprinters who are set to compete at the Showcase.